i've been hearing a few rumblings of curiosity about my white sun hat (mentioned in post #1). 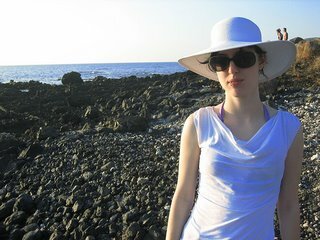 it's just a white beach hat i got for about $10 at some beachy store in hawaii last fall, and this summer i've been wearing it a lot. i'm kind of a sun nazi lately - i practically won't leave the house without sunscreen, sunglasses, and my hat, and i don't hesitate to lecture complete strangers about the dangers of sun exposure (cancer and wrinkles, in that order).